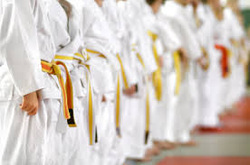 The goal of Titan Karate Academy is to build a martial arts community by helping students to reach individual goals while developing life skills and strong moral character including courtesy, patience, respect, self-control, and integrity. Students of TKA will learn valuable and potentially life saving self-defense techniques, and have the opportunity to study traditional and contemporary kata, weapons, and sparring. Students will also have the opportunity to put these skills to the test through healthy competition at various martial art tournaments throughout the Southeast. This program should not be looked upon as an extracurricular activity but rather as a life training program. The skills that will be learned throughout the Black Belt training process will be beneficial to students of all ages and provide them with the knowledge and skills that will enhance almost every aspect of their life. improves coordination, balance, flexibility, and reflexes. teaches skills that may save your life!